Jim O’Grady is a reporter for WNYC Radio and co-author, with Murray Polner, of Disarmed and Dangerous: The Radical Life and Times of Daniel and Philip Berrigan, Brothers in Religious Faith and Civil Disobedience. The Rev. 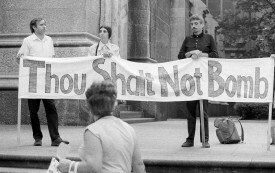 Daniel Berrigan’s urgent, lasting campaign for peace.